My Ecuador Volcano Adventure – Chimborazo and Earthquake (Part 3) | Edita's Blog - "Intotheblu"
The biggest objective of our trip was Chimborazo via the northern (Meyer Glacier) route. This route is rarely climbed due to the logistical difficulties of getting to this remoter side of the mountain. There are no refugios to stay in, so you need to bring all your camping gear and food for the duration of the climb to the foot of the mountain. It’s also very difficult to get to the base camp – you need to hire horses to take camping gear there, and it requires many hours of trekking to get to the start of the glacier at 4,900m. On 16th of April, as it was just starting to get dark, we arrived in Urbina, at Posada “La Estacion” – a mountain lodge run by a friendly guy called Rodrigo Donoso. 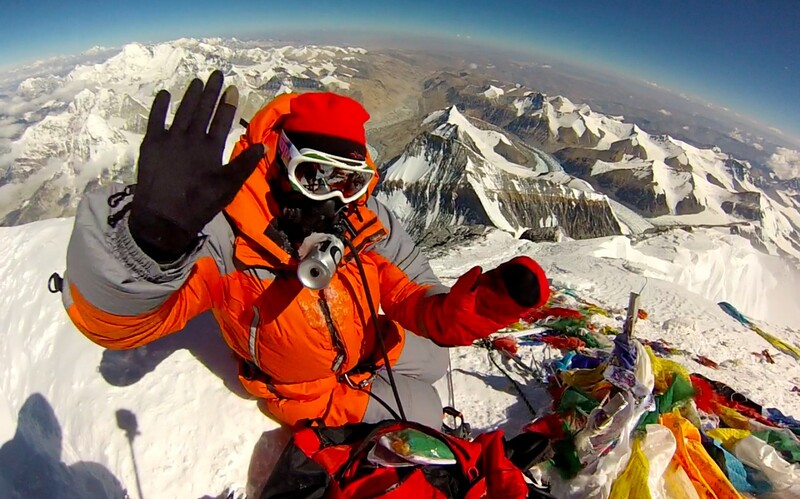 Rodrigo is an accomplished mountaineer and photographer. Posada “La Estacion” is located on the foothills of Chimborazo volcano, in front of the highest train station in Ecuador. We chose this place because of its uniqueness and history. The lodge is full of mountaineering memorabilia, paintings and pictures of famous mountaineers. Many well-known mountain climbers and explorers passed by this place on their way to climb Chimborazo. Just as we were settling in for the evening aperitivo in the dining room, the lodge started rattling and shaking. I knew right away it was another earthquake. Someone shouted “get out, get out”. We ran out into the yard while the earth moved in waves and circles under our feet. Margaret was standing near the house, looking confused. I grabbed her and pulled her away from the house. She gave me a questioning look and I yelled at her. Later she told me that she couldn’t understand the Spanish, and she thought they were all rushing outside to watch the old Urbina train, shaking and rattling the building as it passed by. But she finally understood, and we were standing outside, holding each other like we had a year ago during the earthquake at Everest base camp in Nepal. I couldn’t believe this was happening again, almost exactly a year later, in a different place! (You can read here my account of Nepal earthquake in 2015). The shaking lasted for about a minute, but it felt much longer. The network went down and we did not have much information about what was going on in the rest of the country. Rodrigo, the owner of the lodge, had some family on the coast. He found out that his sister’s house in Pedernales was completely destroyed. The town was close to the epicenter. We went to sleep after dinner, thinking it probably wasn’t too bad. Our guides told us that their families in Quito were fine, unaffected. At around 2 AM, I was woken up by an aftershock that scared me a bit. I noticed there was an SMS from Mark on my phone. He was asking if I was OK. He was telling me that the earthquake was 7.8-magnitude – by a twist of fate, exactly the same as the earthquake in Nepal a year earlier. Many people had been killed, homes were destroyed in the coastal areas, and it was all over the news in the western media. I could no longer sleep that night. In the morning, we decided to continue with the expedition, as the earthquake didn’t affect Chimborazo. This was going to be the last 2-3 days of our trip. We loaded the jeep with our gear and drove off towards the beginning of the trek, leading to the northern (Meyer) glacier of Chimborazo. It took us a good hour or more to reach the area where the jeep could no longer go. The horses that Rodrigo arranged for us were already there, waiting to take our gear up to the base camp. We planned to establish our base camp at the start of the glacier at around 4,900m. As we moved up the mountain, it continued to drizzle. We were cold and drenched. The terrain was difficult – ankle-twisting grassy slopes to begin with, followed by steep moraines, full of loose rock. As we were getting higher and higher on the mountain, the horses were becoming tired. At one point, some 200 meters below the planned base camp location, the horses refused to continue. They stood there shivering – getting cold and thirsty. Our horsemen were two young boys who had probably never been to that altitude before. They were afraid the horses would not survive if they continued. They wanted to offload the bags right there, on rather exposed moraine, with no drinking water close by. Benno managed to convince the horsemen to go down until we found a suitable site for our base camp. Luckily, after descending some 100 meters, we found a grassy area, next to a running stream. We hurried to build our kitchen and sleeping tents. The rain was pouring by now. In the end, the location of the camp did not make any difference – the rain and clouds never left us for the entire stay on the mountain, except for one brief moment on the second night. That moment enabled us to launch our summit attempt. We managed to reach the glacier but only to turn around as soon as we arrived. The visibility was gone completely. The rain was rapidly turning into snow and ice. A couple of times we got lost in the dark and fog that was covering the entire mountain. I was really glad when we finally stumbled into the base camp! We didn’t have luck with the weather on Chimborazo’s Meyer Glacier, but we experienced a very unique part of the mountain that has been climbed by few people. The glacier is very remote; the summit day is long and strenuous. It could have taken us 18 hours to climb up and back to the base camp. Even though nature defeated us this time, Chimborazo North remains unfinished business for me. I shall return. Volcanoes of Ecuador – Teaser from Nanook on Vimeo. For more photos from my Ecuador Volcano Adventure, click here.